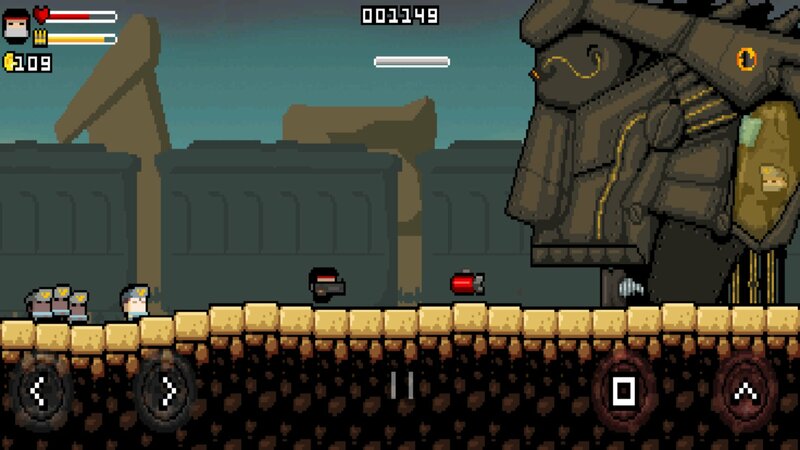 Gunslugs 2 ($1.99) is a really sloppy game that revels in that fact. It’s fast, you might not be able to tell what’s going on all the time, and it just feels unrefined. But the game caters to the fact that it’s chaotic, and makes for another great run ‘n gun from Orangepixel, the veteran iOS solo developer who keeps putting out solid stuff. The run ‘n gun genre has seen few original entries: the genre has basically peaked with Contra and Metal Slug ($2.99). 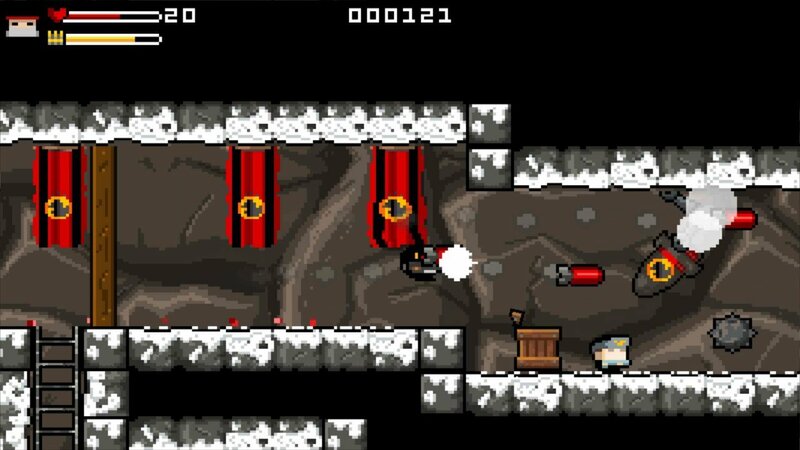 However, there was Gunslugs ($1.99), which applied a mobile-friendly take on the run ‘n gun. Gunslugs 2 does a lot of the same things, and it’s the kind of sequel where unless you go back to the original, you might not know what exactly is new. Well, Gunslugs 2 is a lot faster of a game. The game goes at a lightning pace, with explosions and enemies all over the place. There’s an ammo meter for even the basic gun, but ammo pickups are common, as are new guns and different characters, which restore your health and give you their default weapon. Coins are collected while playing, and can be used to buy powerups like armor – this isn’t an IAP thing at all, don’t worry. Gunslugs 2 winds up being a bit different from other run ‘n gun games, where one slip-up was swiftly punished by the gaming gods: here, health is lost quite often. But health pickups are common. As such, taking damage isn’t good, especially in the arcade mode, but it’s not bad. This is where the sloppy feel comes in: you can be really reckless in this game, just as long as you’re constantly killing and picking up health packs, and rescuing characters, you’re usually good. Just be careful when health is low, or if you’re in the one-life arcade mode. I’ve mentioned the arcade mode, but the brunt of the game for most players will be the Story mode, which goes through the game on a level-by-level basis, with your choice of starting character, new ones unlocking after each world. There are the three beacon towers in each of the normal levels, and while they basically were destroyed instantaneously in the original game, here they serve as little mini-levels, which are randomly generated each time you go into them. At the end of each world is a boss fight, which tend to be affairs involving either “find the weak point when revealed" or “unleash the entire armory on the sucker’s face." The arcade mode is unlocked when the story mode is beaten for the first time, which isn’t a difficult affair. Arcade mode runs through the entire game in one life, tracking high score along the way, so you have to be careful to play through this: it’s a fresh challenge, but I’m glad it’s split from story mode. The game lets you see everything it’s got, and while it’s not overly long, I think it also gets its point across in the time it does. This is part of why I marked down Gunbrick ($5.99) – I felt like its length was lacking, that it could have been more ambitious. This game does a good job at being scoped just about perfectly, though it can feel repetitive as the levels follow the same structure each time out, just introducing new wrinkles in each world. Orangepixel’s house style is in play here: the pixel art with squared-off characters is ever-present. It’s very distinctive in part because it’s so consistent throughout Orangepixel games to use this style of pixel art. The dialogue is very quirky, and there’s loads of references to action movies past and present that are barely obscured. It’s unmistakable. Regular music contributor Gavin Harrison provides the soundtrack. The game uses the familiar simple control scheme of two buttons on each side that other games from Orangepixel have, with MFi gamepad support as well. I think that the fast-and-loose pace of the game and the health may sink this game for some: people who like precision in their games will find it very sloppy, and hard to manage not taking damage without being very careful. And even then, there are many threats later on that essentially force you to take small amounts of damage to continue on. It’s just the nature of the game, and it is balanced out to where you have plenty of opportunities to stay alive, so it’s fair. It’s just a matter of feel, and I’d suggest giving the desktop demo a shot to see if it’s right for you. I kind of like the system of give-and-take with the health because I tend to be very bad at not taking damage in games (this may make my Wayward Souls ($6.99) game of the year pick seem baffling), but the game could do a better job at perhaps signaling when damage has been taken. As well, while the coins are hardly a scarce resource, keeping armor for more than a few seconds can be difficult! Also, the character changes, while welcome ways to regain health, also mean that it’s possible to lose a great weapon in exchange for earlier characters’ default pea shooters. Dual guns or rockets? I’ll take the rockets, thank you. 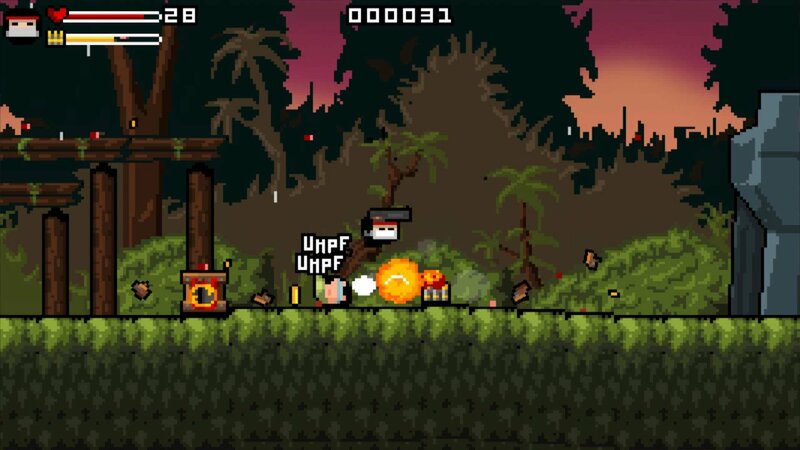 Gunslugs 2 is a unique run ‘n gun game, for better or for worse, but considering that not many developers are trying to take the modern run ‘n gun crown, if shooting enemies by the hundreds sounds like a rollicking good time, then check this out.